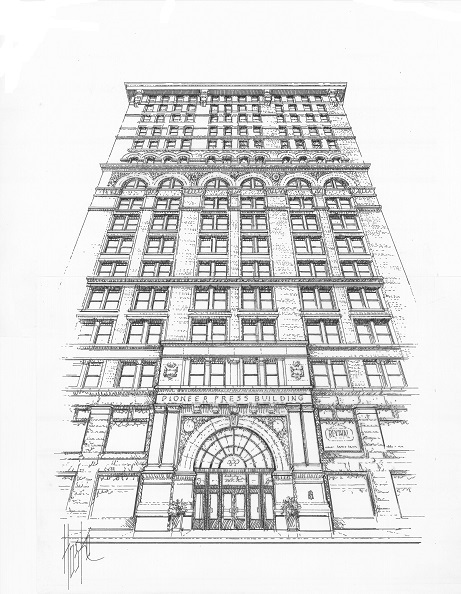 In 1889, “The Pioneer Building’s owner boasted on his stationery that the building stood at the Business Heart of Saint Paul.” The high value of land in the “100 percent block” demanded a tall building so the Pioneer Press looked to Chicago for an architect (Solon Beman) familiar with the new metal skeleton-frame construction technique that made skyscrapers possible. The twelve-story walls rose higher than any others in Saint Paul. An elevator ride to the top floor offers an excellent view of the inner workings of the lift mechanism, the steel bracing that reinforces the four floors added in 1910, and the only surviving example of an open light court in the Twin Cities.” ‘For over a century, the Pioneer Press Building has remained one of Saint Paul's most enduring downtown landmarks. Today, this elegantly renovated 16-story building, alongside the Endicott on Robert and Endicott on Fourth buildings, has been re-imagined to meet the needs of today's downtown resident - while maintaining its 19th Century aura as a former regional newspaper’s headquarters’.